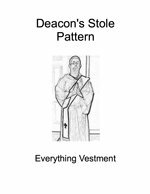 This deacon stole pattern provides you with the pattern and full instructions to make a fully lined deacon's stole. For this pattern, you will need approximately one and a half yards of liturgical fabric, one and a half yards of matching satin, and a 20" x 50" piece of canvas. You will also need matching polyester/cotton thread, a yard of gold fringe and two 1-inch, gold crosses. While sewing a deacon's stole isn’t a complicated process, it does take some sewing skills to successfully sew a deacon's stole using our deacon's stole pattern. Plus, there are some techniques you must learn if you want a deacon's stole that looks professional and hangs beautifully. You can learn the steps, along with a few secrets to make your project a success by clicking here. We're pleased to announce our new shopping experience. Visit our store today to find patterns, fabric and trim to make a full vestment set. We also provide incense, anointing oils and Christian jewelry for sale - all hand crafted and from the Holy Land. At Everything Vestment we strive to provide the best products at the most reasonable price available. Thank you for stopping by and come back often, as we are constantly adding to our supply of goods available for sale. Did you know that the liturgical stole has been in use since the first century BC when it was fashionable to carry about a rectangular piece of fine linen usually embroidered with silk and gold? Eventually servants began using this rectangular piece of cloth to clean vessels and utensils. By the third century AD, these cloths were used during Holy Eucharist to wipe the vessels that contained the bread and wine. You can learn more about vestment history by clicking here.